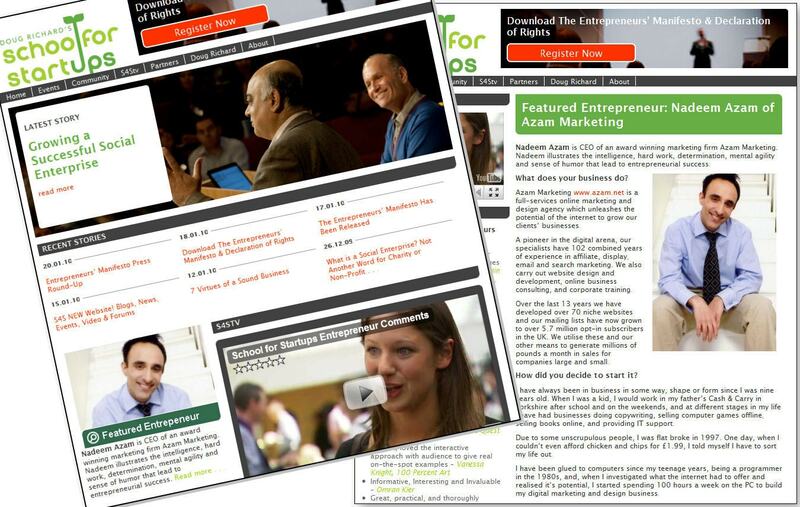 School for Startups is the UK’s leading provider of business training for entrepreneurs, with lots of useful information on their website and regular one-day business courses. It is the inspiration of serial entrepreneur and angel investor Doug Richard, who many of you will know as a ‘dragon’ or investor in the first two series of BBC’s Dragon’s Den. I was told that Doug, who has seen some of the revenue figures of Azam Marketing, was “VERY impressed” with how well we were doing and invited to become a Featured Entrepreneur on his site. I think School for Startups does a wonderful job to inspire and educate budding entrepreneurs, and so agreed to be interviewed. The interview has just been published and you can read it below. Nadeem Azam is CEO of an award winning marketing firm Azam Marketing. Nadeem illustrates the intelligence, hard work, determination, mental agility and sense of humor that lead to entrepreneurial success. Azam Marketing www.azam.net is a full-services online marketing and design agency which unleashes the potential of the internet to grow our clientsâ€™ businesses. A pioneer in the digital arena, our specialists have 102 combined years of experience in affiliate, display, email and search marketing. We also carry out website design and development, online business consulting, and corporate training. Over the last 13 years we have developed over 70 niche websites and our mailing lists have now grown to over 5.7 million opt-in subscribers in the UK. We utilise these and our other means to generate millions of pounds a month in sales for companies large and small. How did you decide to start it? I have always been in business in some way, shape or form since I was nine years old. When I was a kid, I would work in my fatherâ€™s Cash & Carry in Yorkshire after school and on the weekends, and at different stages in my life I have had businesses doing copywriting, selling computer games offline, selling books online, and providing IT support. Due to some unscrupulous people, I was flat broke in 1997. One day, when I couldnâ€™t even afford chicken and chips for Â£1.99, I told myself I have to sort my life out. I have been glued to computers since my teenage years, being a programmer in the 1980s, and, when I investigated what the internet had to offer and realised itâ€™s potential, I started spending 100 hours a week on the PC to build my digital marketing and design business. What were your toughest challenges? One of the first challenges was developing an internet business when I couldnâ€™t afford to get online! So I enrolled on a course at my local college and that gave me access to their computer centre. I would be the first one there at 9:30am each morning and the last one out at 9pm every night. It was a challenge trying to code websites when the teenagers around me would be swearing and fighting all the time and flicking paper at each other past my nose! The hardest part in the early years was surviving when I was not making any money. I lived off Tesco baked beans for years! It took me six months to generate my first sale online, which I think was an Eastenders book, and I made 68p profit. And then, when Iâ€™d grown the business, the dot.com crash happened in which my clients and advertisers collapsed like nine pins. It was like a kick in the stomach and the business had to go back to square one. But, by the grace of God, I survived all those difficult times and, today, 13 years later weâ€™re in a healthy position and growing faster than ever. We tripled in size last year. What sites do you recommend? Which entrepreneurs do you admire most? Bill Gates is a personal hero of mine, because he proves the geek can inherit the earth! He had the conviction to take a leave of absence from Harvard to create Microsoft, had the vision to see the money would be on the software rather than the hardware side, and developed a formidable global company. There are a lot of people who have achieved nothing in life who mock Bill Gates, but I have the highest of respect for somebody who works his way to the very top and then gives away billions of dollars to the needy.